222 pages | 25 Color Illus. | 130 B/W Illus. This book focuses on human anatomy and medicine and specifically on both muscular and skeletal birth defects in humans with trisomy. 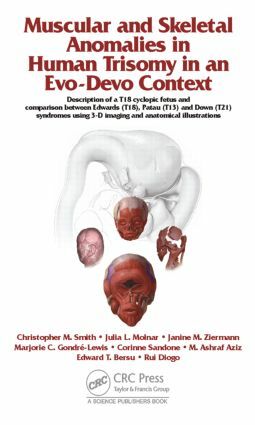 Moreover, this book also deals with Down syndrome, which is one of the most studied human syndromes and, due to its high incidence and the fact that individuals with this syndrome often live until adulthood, is of special interest to the scientific and medical community. This new line of inquiry is addressed to a wide audience, including medical researchers, physicians, surgeons, medical and dental students, pathologists, and pediatricians, among others, while also being of interest to developmental and evolutionary biologists, anatomists, functional morphologists, and zoologists.